The FLI CenterLine color filter wheels feature a centrally located aperture that presents a symmetrical mass distribution and eliminates the offset weight problems associated with virtually every other color filter wheel on the market. It is also ideal for prime focus installations where a zero or symmetric shading of the primary mirror is critical. The CL1-10 CFW presents an easier load to handle vs. a normal color filter wheel and it will not change a telescope's balance as it tracks across the sky. 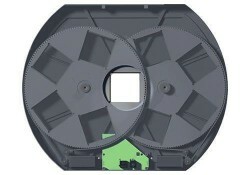 The FLI CenterLine also allows for filter combinations unavailable with traditional style filter wheels.